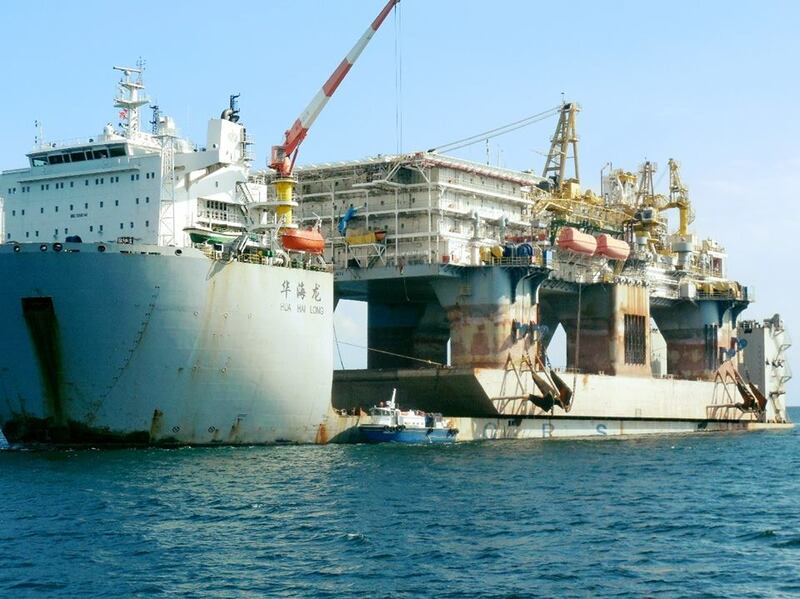 Pictured: The semi-submersible heavy-lift vessel, the Hua Hai Long, which is currently moving the giant SKD Jaya drill rig from Trinidad to Walvis Bay. The unique characteristics of the marine industrial complex situated in Walvis Bay makes it one of the choice destinations for ship repair on the Atlantic seaboard of the African Continent. Two giant vessels are scheduled to visit the port of Walvis Bay in the beginning of March. One is the 15,839 ton semi-submersible, self-erecting tender-assisted drilling platform, the SKD Jaya and the other is the semi-submersible heavy-lift vessel, the Hua Hai Long. 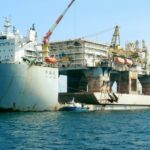 The SKD Jaya is scheduled for repair by Elgin Brown and Hamer Namibia and the Hua Hai Long will transport the giant rig to Namibia’s main port. Sapura Energy has selected ENHN in Walvis Bay company to reactivate their self-erecting tender-assisted drilling platform, the SKD Jaya. According to EBHN Marketing Manager Quintin Simon securing the contract to do the repair an maintenance work on the giant rig is major vote of confidence in Elgin Brown and Hamer Namibia (EBHN). “We are delighted to be able to announce the successful conclusion of the agreement with Sapura Energy, as it endorses EBHN’s high levels of expertise and experience in servicing the international offshore oil and gas sector. This key new project is a strong vote of confidence in EBH Namibia, which highlights the strategic relevance of the company as the preferred ship repair partner conveniently located on Africa’s West coast,” Simon explained. The confidence shown by the international offshore oil and gas sector is underpinned by EBH Namibia’s majority shareholder Namport’s multi-billion Namibian Dollar investment in the expansion of the Walvis Bay port, enabling the berthing of larger vessels which creates many beneficial downstream opportunities for local service industries. “We would like to thank the management team of Namport for assisting us by enabling the extended stay berthing facility for the duration of this important project,” Simon added. The SKD Jaya,rig has been ‘cold stacked’ in the Gulf of Paria, which is offshore of Trinidad since 2016. Cold stacking involves the partial decommissioning of a vessel when it appears that it will not be in use for an extended period of time. However, as vessels deteriorate due to the impact of salt and weather, returning them to full working condition is a fairly lengthy and involved procedure. “Reactivating a very large structure such as the SKD Jaya firstly involves a detailed inspection above and below the waterline. The scope of work will include full shipyard marine engineering services, such as metal work, fabrication, carpentry, mechanical, coatings and electrical,” Simon said. Sapura Energy will use a semi-submersible heavy-lift vessel, the Hua Hai Long, to move the SKD Jaya from Trinidad to Walvis Bay. The project is set to commence when the rig arrives in Walvis Bay on the first day of March 2019 and will utilise the services of a highly skilled and well-resourced rig repair team. EBH Namibia and Walvis Bay is the only shipyard on Africa’s West Coast that can offer this comprehensive service capability. “Following the dramatic fall in oil prices in mid-2014, trading conditions for the industry have been severely constrained. Now, nearly five years later, there is cautious optimism regarding an upswing in the oil industry, as the level of demand in the offshore market – especially along the West Coast of Africa – has seen a significant increase recently. The SKD Jaya project is an extremely positive sign, and we are working hard to ensure further rig and ship repair projects come our way going forward,” Simon pointed out. “Our long history of unrivaled experience and expertise in the offshore repair sector, supported by our all-inclusive shipyard facilities, highly skilled and trained resources and optimised processes and procedures, mean that we are ideally placed to provide top-class, innovative services in line with our client’s requirements,” EBHN Acting CEO Heritha Nankole Muyoba said. “We anticipate that this rig reactivation project is the first of a number, which will provide EBHN and our relevant stakeholders – as well as the local Walvis Bay community – with strong sustainable revenue into the future,” she concluded.